I wish there was a way I could color other people’s work for a living. I really really enjoy picking out colors. Thankfully I have a very talented husband who humors me by sending me his files to play with for work. At the first of September he told me that one of the designers at Automattic was wanting submissions for color palettes to use for the backend side of WordPress. The plugin is MP6. Dave is one of the contributors to the plugin so he asked me if I’d send him some to possibly be used! Y’all. I created a bunch of palettes, and lo and behold, MY PALETTE WAS PICKED! The color scheme is Midnight. I also did Sunrise, Vineyard, and Primary. I’ve been receiving tweets about the new palette. And it’s been awesome to read reviews about it! (The WordPress community is very massive and very involved.) 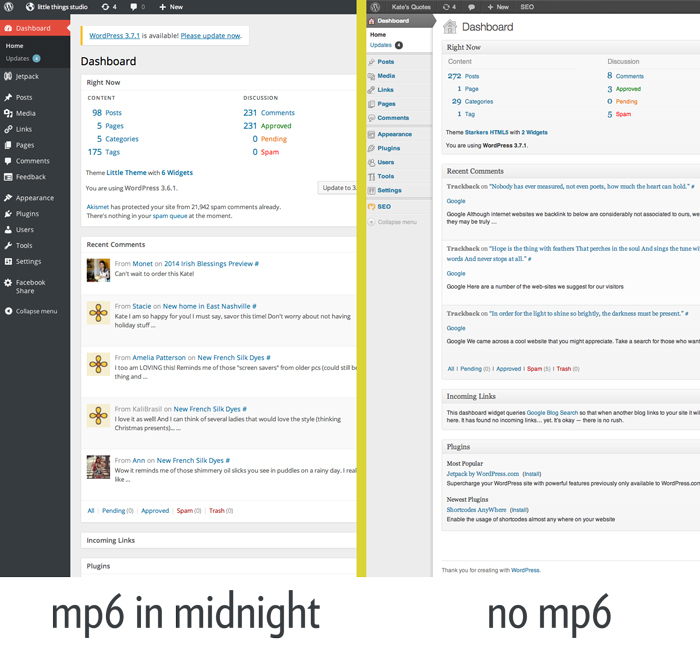 The MP6 plugin is a really awesome plugin. Here is a comparison shot of what it looks like with and without MP6. It gave me so much joy that I could contribute to WordPress, considering I purposely try to FORGET code! HA!